SoftCo is a provider of financial automation solutions that increase productivity, reduce costs, and ensure organizations meet their compliance obligations. SoftCo is a global organization with offices in Ireland, the UK, the USA, and the Nordics. SoftCo is ISO 27001 certified, a Microsoft Gold Partner, and an AWS Advanced Technology Partner. 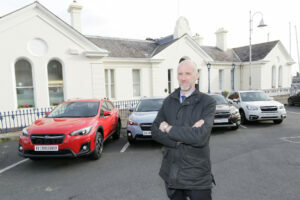 Merrion Fleet are one of Ireland’s largest independent fleet management companies currently managing in excess of 6.000 vehicles, with fleet sizes ranging from 1 to 750 vehicles. During the course of our almost ten years in business, Lewis Motors has been building our reputation for excellent service, based on our commitment to providing our customers with high quality cars at very affordable prices. Lewis Motors is well known as a quality motor dealership thanks to recommendations from satisfied customers, and Alan and the entire team at Lewis Motors take great pride in this fact. Subaru invite you to come and see our range of versatile and capable ‘go anywhere’ life-style Subaru AWD vehicles at Castle Garage Bray. We have a fantastic line-up, the new XV Crossover, new Impreza, Forester, Outback, BRZ and Levorg models. With safety at the core of every one of our Subaru’s, safety features, such as Eyesight Safety Technology and Subaru Rear Vehicle Detection work together to spot potentially dangerous encounters before they even happen. A Subaru is safer for drivers, safer for passengers and safer for pedestrians. Every model is powered by Subaru’s award-winning Boxer engine, and every model, except for BRZ, has full-time All-Wheel Drive, sending power to the wheels that need it most, keeping you safe and in control, even in the toughest conditions, be that urban or rural landscapes. Castle Garage is a family owned and operated garage in business for over 60 years located in the heart of Bray just 2 minutes off the M11. As well as stocking a large range of new and pre-owned cars we have a full service and parts department catering for all makes and models. At Castle Garage we genuinely believe in putting the customer first and pride ourselves on our large network of loyal customers. The team at the Specialist Orthodontic Practice (SOP) in Glenageary has been providing high-quality, patient-centred orthodontic care to adults, teenagers and children in our local community since 1988. We believe that you deserve the best orthodontic treatment from initial consultation through the treatment process all the way to the final result – that’s why we became Specialists! In order to provide you with the best orthodontic treatment, we base our care on three cornerstones: 1. extensive clinical experience, 2. evidence from the latest and best dental research and 3. getting to know who you are and what suits your life. We offer fixed and removable appliance options as well as self-ligating, lingual and clear aligner systems. We provide custom-made, high-performing mouthguards for maximum protection to lots of active and sporty members in our local community. Dr Geoghegan is also experienced in the treatment of obstructive sleep apnoea and can help patients with a personalised solution to relief the impact of this syndrome. Our specialised team work together to oversee bespoke treatments for all patients and ensure that you feel completely happy with your orthodontic care. We know the importance of listening to every patient’s unique needs and objectives. Because the process is collaborative, our patients consistently report how results exceed their expectations. The team at SOP is proud to support Monkstown Hockey Club as it underlines SOP’s commitment to engaging with our wonderful local community as well as delivering beautiful smiles that last a lifetime.